Have you ever been inside a lighthouse? Have you ever wondered what it would be like to climb to the top? When I visited Currituck Lighthouse in August I was able to go into the lighthouse and takes some photographs. On my lens I give you a pictorial view where you will be able to see the inside of the lighthouse. I show photos of the lighthouse grounds, the entrance and display on the first landing and best of all you can look up the winding spiral staircase inside the lighthouse. 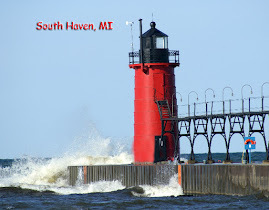 Stop by Lighthouse Enthusiast to see our featured lensmaster- Heather Burns. Heather and her husband Richard are very interested in lighthouses. Here are comments from Heather on her interest in lighthouses. I think the best way to describe our fascination with lighthouses is what I wrote on one of our lighthouse lenses: ...worldwide they symbolize Hope to sea navigators. In a storm they are the beacon guiding sailors home to a safe shore, in the dark, a bright light in the darkness, in the daylight, a tall beacon marking safety...to all they say Welcome...you are almost home. What a comforting thought! Plus they are anciently designed architectural wonders. They must withstand the rigors of sea water, sea air, storms and waves. And they must be the exact size to accommodate the lanterns themselves. Even though we don't actually need them any more, they remind us of the time long ago when maritime activity depended on them. In short they are a link to our past. Rich and I like that reminder. 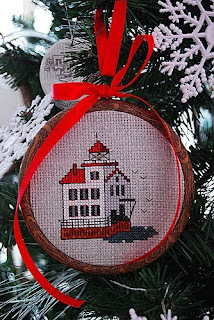 I love lighthouses and I love Christmas ornaments so writing a lens on Lighthouse Christmas Ornaments was a natural for me. I hope you enjoy the selection that I've picked for you.